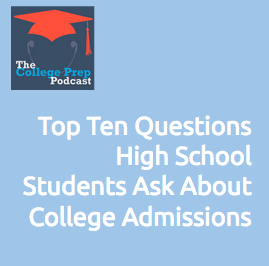 What concerns do motivated high school students have about the college admissions process? Megan recently fielded questions for George Ranch High School National Honor Society students. Here’s the great list of questions they asked; tune in to the podcast episode to hear Megan’s answers. 1. How many schools should I apply to? 2. 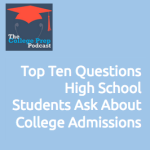 What is your number 1 tip for applying to college? 3. How does choosing a major work? What if I am undecided? 4. What is the difference between priority and regular deadline? Which one do you recommend? 5. Do you have any advice for applying to an honors program? 6. Should I submit all my SAT and ACT scores or just the best ones? 7. How long should my essay be? 8. How significant are the essays relative to the rest of the application? 9. What is the number 1 mistake that students when applying? 10. How can I go about to get financial aid for college, beyond scholarships? « 074: Are You Guilty of These Teaching & Studying Mistakes?